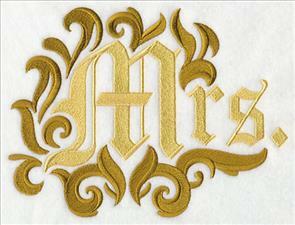 Embroiderers have the best ideas for new designs. We love reading your suggestions and requests! We receive dozens of ideas for new designs every week. And, when those requests start piling up and flooding our inboxes, we have an extra-special "request-fest" where ALL the new designs are based on your ideas! 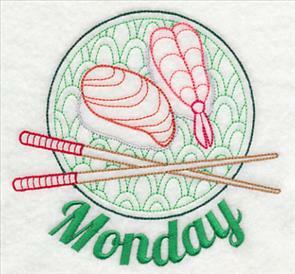 Designs this week are a colorful and vibrant array of ideas, subjects and styles. Scroll down the page to see these stunning new designs, and let your creativity run wild with possibilities! totes, table linens, and hand towels! Kristin from New Mexico is a member of The Hummingbird Society. One of her favorite humming-birds is the Tufted Coquette, also known as the "punk rock hummer." The feathers on his head are certainly distinct and eye-catching! Thank you, Kristin, for your request! 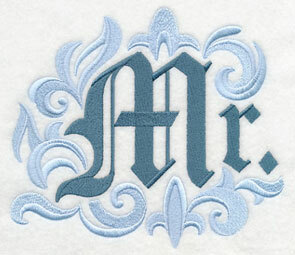 7.16" x 6.86" and 6.11" x 5.86" and 5.04" x 4.83"
Wendy enjoyed the Damask His and Hers designs, and asked for Mr. and Mrs. versions in the same style. We loved the idea, and added a "Ms." for good measure! Three different color schemes are shown below. Choose colors that suit your bath decor, or personal preference. 6.68" x 5.86" and 6.06" x 5.32"
7.79" x 5.86" and 7.07" x 5.32"
6.42" x 4.84" and 3.88" x 2.93"
6.73" x 5.88" and 6.11" x 5.34" and 5.55" x 4.86" and 3.36" x 2.94"
Linda requested something fashionable, and something French. Madame, Mademoiselle, and Monsieur is a perfect fit! 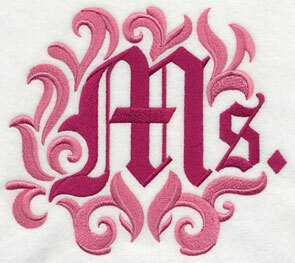 The designs are elegant additions to bath towels and robes - and delightful on shirts and jackets, too. 7.72" x 3.26" and 6.38" x 2.70"
9.41" x 3.35" and 7.83" x 2.79"
6.86" x 2.44" and 3.87" x 1.39"
7.72" x 3.26" and 6.38" x 2.70" and 5.67" x 2.40" and 3.87" x 1.65"
Linda and Bonnie sent in their ideas for designs in different languages. We included artistic elements relating to each country, too. 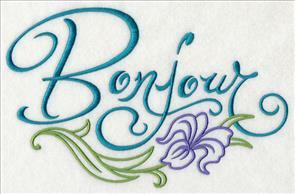 English "Good morning" is accompanied by a delicate rose; French "Bonjour" is paired with an iris in full bloom. 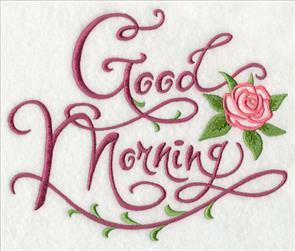 8.91" x 5.87" and 6.86" x 4.53" and 3.87" x 2.56"
Begin every day with a bright and cheerful message. 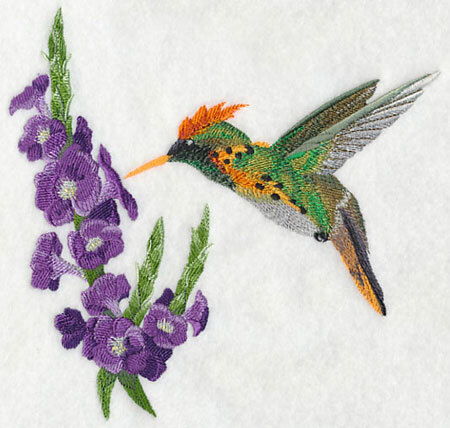 Add these designs to placemats and tea towels! 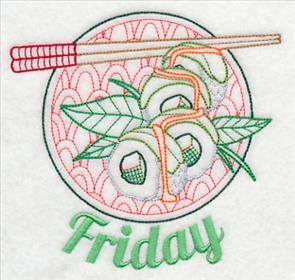 A medium-weight cutaway stabilizer is an excellent choice when embroidering onto cotton or linen. Cutaway stabilizer provides a foundation for the fabric, keeping the stitches clean and crisp. 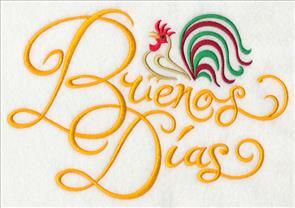 Buenos Dias ("good day" in Spanish) is accompanied by a colorful rooster. 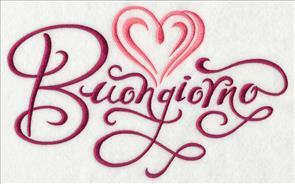 And Buongiorno, from romantic Italy, is paired with a heart. 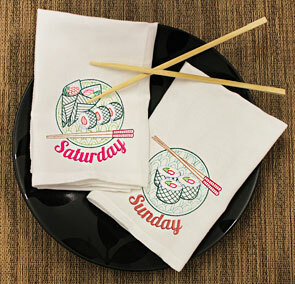 Sweet on tea towels and table linens! 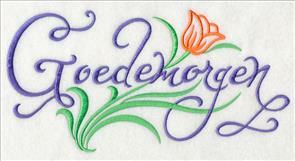 9.42" x 5.85" and 6.86" x 4.26" and 3.87" x 2.42"
A Dutch "Goedemorgen" is accompanied by a colorful tulip. 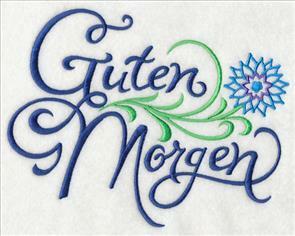 German "Guten Morgen" is paired with the national flower, the blue cornflower. 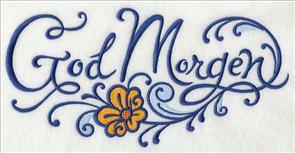 7.59" x 5.87" and 6.29" x 4.86" and 3.90" x 2.92"
Norway's "God Morgen" is elegant with a simple Rosemaling flower. 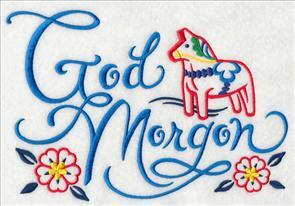 And, Sweden's "God Morgon" is perfectly paired with a Dala horse. 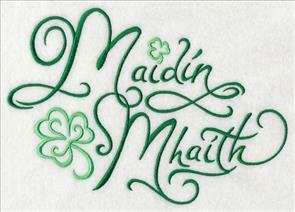 8.47" x 5.87" and 6.87" x 4.76" and 3.87" x 2.69"
Irish Gaelic "Maidin Mhaith" is accompanied by lively shamrocks. 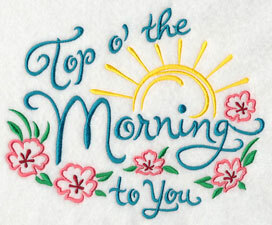 And, a whimsical "Top o' the Morning to you" is sunny and bright on placemats, tea towels, and tote bags. 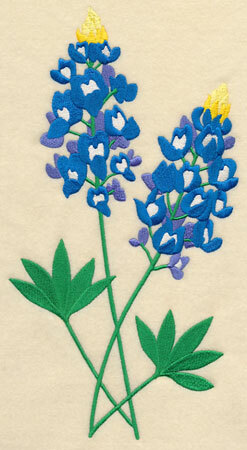 7.13" x 5.87" and 5.88" x 4.84" and 3.87" x 3.19"
Texans love their wildflowers - especially the bright and beautiful bluebonnets! Karen, Vicki, Rachel, and Judi have all requested this flower in different shapes, sizes, and compositions. 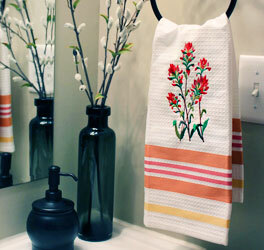 Grow a garden on tote bags, table linens, and wall hangings! 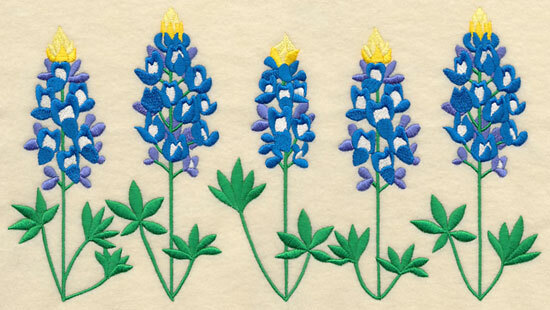 6.27" x 11.75" and 5.02" x 9.40"
4.18" x 7.83" and 3.66" x 6.86"
A border of bluebonnets is delightful on tea towels, table linens, and bolster pillows, too. Leave the wildflowers in the fields, but celebrate the beauty year-round with these designs. 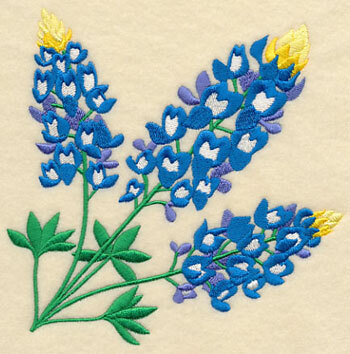 11.75" x 6.45" and 9.41" x 5.17" and 7.83" x 4.30" and 6.00" x 3.53" and 3.86" x 2.69"
This sprig of bluebonnets is a perfect shape for linen napkins, wash cloths, pockets, and the corners of quilts. Add the corner to placemats and tablecloths for colorful effect! 5.89" x 5.86" and 4.88" x 4.86" and 3.86" x 3.84"
Pick your favorite shapes and sizes by using the links above, or get the whole bouquet in a design pack! The pack is in four sizes to suit a variety of projects and machine sizes. Click on the links below to see the designs included in the packs, and prices. 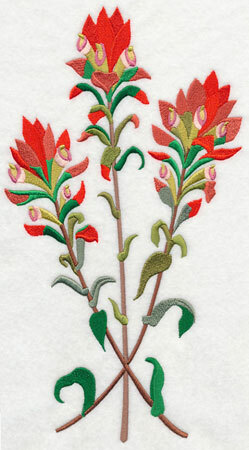 Dana writes, "I need Indian Paintbrush....let's make Lady Bird proud. Texas wildflower are awesome!" Indeed they are, Dana, and thank you for the suggestion! Judi adds, "This time of year makes me yearn to be back home in Texas where [the wildflowers] are in bloom." Thank you, Judi - we are happy to oblige! 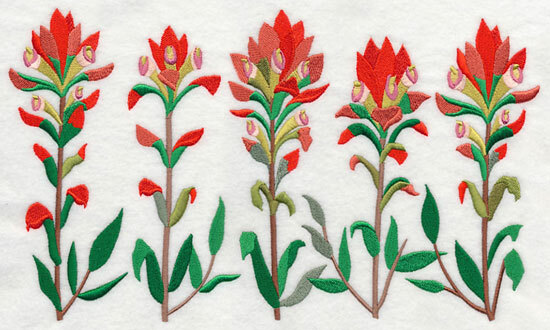 A colorful border of Indian paintbrush (also called prairie-fire and Castilleja) is eye-catching on quilts, bolster pillows, placemats, and bath towels. 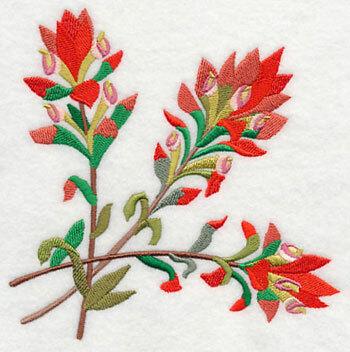 11.63" x 6.88" and 9.38" x 5.54" and 7.80" x 4.61" and 6.00" x 3.80" and 3.88" x 2.95"
Add a corner of Texas wildflowers to napkins, placemats, and pockets. Your projects will bloom as bright as the prairie! 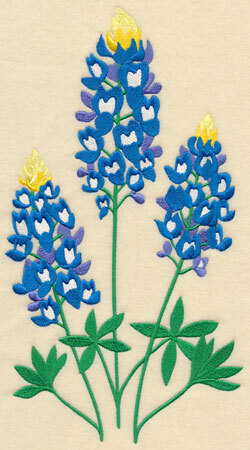 5.87" x 5.81" and 4.88" x 4.83" and 3.88" x 3.85"
Celebrate wildflower season with these designs! You can order them individually by using the links above, or buy them in a design pack. The pack is in four sizes. Click on a link below to see the designs included in the packs, and prices. 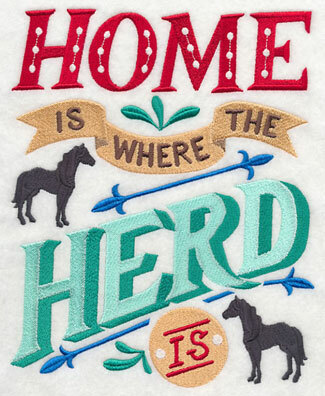 Kathleen saw the "Home is Where the Herd Is" design with cows, and asked for a similar design with horses. 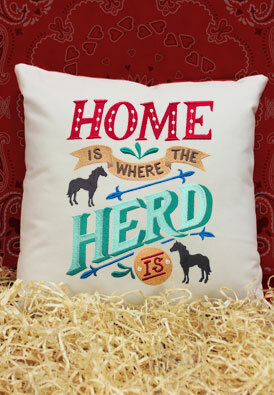 Let this design stampeded onto pillow shams and tote bags! 6.91" x 8.54" and 5.86" x 7.24"
4.88" x 6.03" and 3.12" x 3.86"
Faye from Australia wrote to say that a Guinea pig stack would be an excellent addition to the collection. 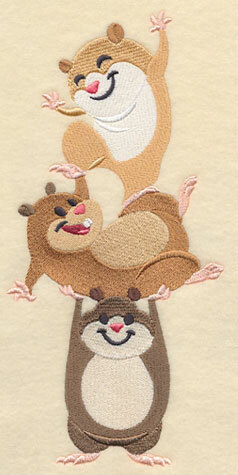 She embroiders things for children, and has hade many requests for this critter. 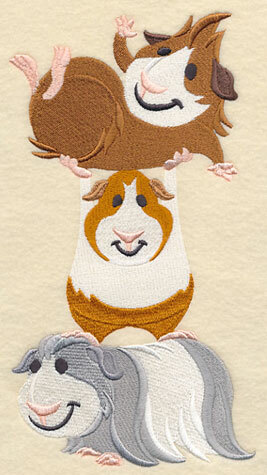 Margaret wrote in with a similar request for hamsters, and these sweet and lovable designs were born. 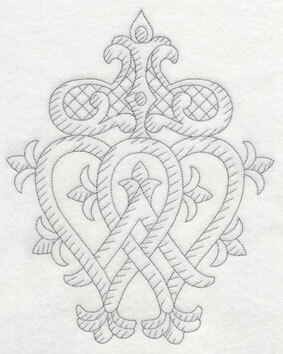 4.50" x 9.41" and 3.30" x 6.90" and 1.84" x 3.86"
Irene asked for a Luckenbooth - the Scottish symbol of love. 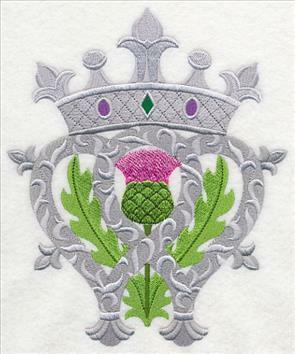 A thistle is combined with overlapping hearts, and a crown. 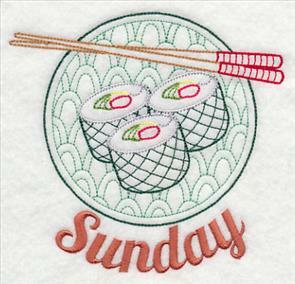 A full-color version is available, as well as a quick-to-stitch sketch version. 6.55" x 7.79" and 5.86" x 6.98"
6.90" x 8.58" and 5.85" x 7.28"
3.90" x 4.85" and 3.09" x 3.85"
Christine loves the quick-stitching day of the week designs, but was looking for something a bit more contemporary for the subject matter. 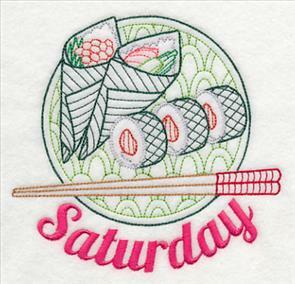 "Sushi, please?" she wrote. "Aidea o arigato," we replied! 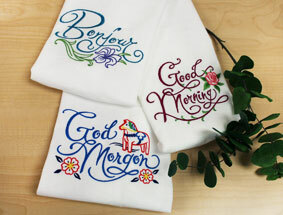 5.12" x 4.86" and 3.86" x 3.66"
Make a set of tea towels with these colorful designs! 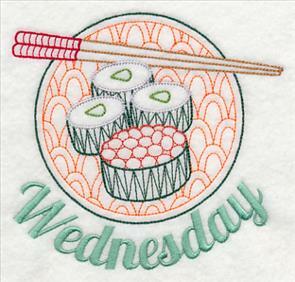 The text is on a separate color stop, so you can easily omit it and use the sushi designs on items like aprons, napkins, and placemats. 5.14" x 4.86" and 3.86" x 3.66"
Find good-quality tea towels at Target, Home Goods, Kohl's, and TJ Maxx. Online sources included JoAnn's (the Aunt Martha brand), All About Blanks, and The Sewphisticated Stitcher. 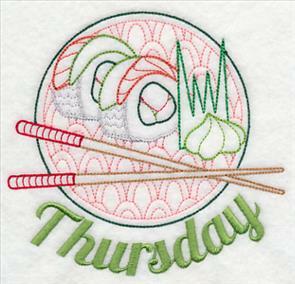 5.09" x 4.87" and 3.86" x 3.70"
Add savory flavor, and international flair, to your kitchen decor with these designs! Vintage-style designs are light and open, and they're a perfect match for tea towels, quilter's cotton, and linen. 5.14" x 4.86" and 3.86" x 3.65"
Add Asian flavor to your home with these light-and-lively designs! Bring contemporary Asian style to your kitchen decor with these designs! 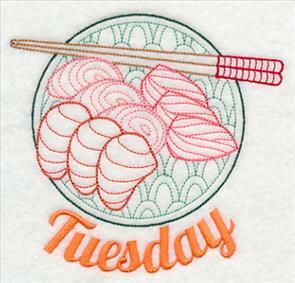 The "day of the week" is on a separate color stop, so you can easily delete it or skip it and add the sushi to placemats, napkins, and other items.